Thomas Netter (c.1375-1430) of [Saffron] Walden, was a Carmelite opponent of Wyclif and the Lollards, who held various posts before becoming confessor to Henry V. His main surviving written work is his 'Doctrine Of The Faith', an anti-Lollard treatise. 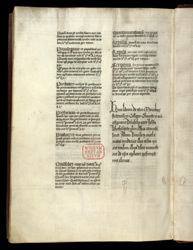 This manuscript was given for the use of St. Albans monks studying at Gloucester College, Oxford, by John Wheathamstead (d.1464), between his resignation as abbot of St. Albans in 1440, and his re-election in 1451. Added at the end of the text, in a fine formal script, is an inscription stating that John Whethamstede, former abbot of St. Albans, gave this book for the use of the monks studying at Gloucester College, Oxford; followed by an anathema.